Nanimarquina, Antique 3 carpet: Two aspects of this collection really stand out: its vintage look and an innovative artisan technique specially created for this product. Its design is inspired by antique rugs, and its neutral colours and floral patterns bring warmth to any room. Nanimarquina, Antique 3 carpet: Two aspects of this collection really stand out: its vintage look and an innovative artisan technique specially created for this product. 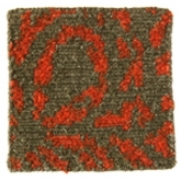 Its design is inspired by antique rugs, and its neutral colours and floral patterns bring warmth to any room. The weaving technique used in this collection, known as hand knotted sumak, is the result of a great amount of work and imagination on the part of the Indian weavers. A thin braid is formed knot by knot, thus acquiring a distressed look, but at the same time producing a high-quality result.